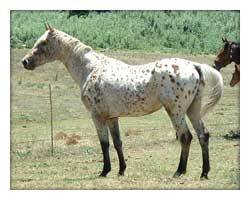 Appaloosa dark spots – which of course only show up against a lighter background – are caused by the dominant SdS allele. 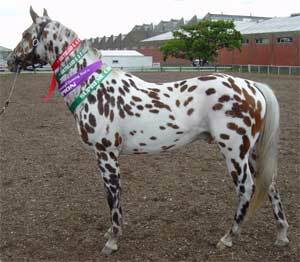 Sometimes the spots are the same shade as the coat color, sometimes they are a little darker, but they are not lighter. So on a standard chestnut the spots may be chestnut or liver chestnut, but not light chestnut (sorrel). Dark spots often occur with snowcap to form a spotted blanket and leopard spot patterns. 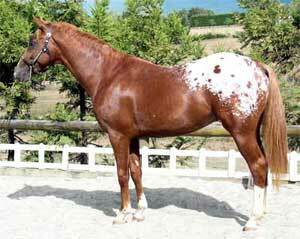 The spots themselves can be quite large - as big as a fist – with the larger spots tending to be oval rather than round, often with roan edges. They follow the direction of the hair, for example, being more horizontal over the quarters and more vertical over the flanks. 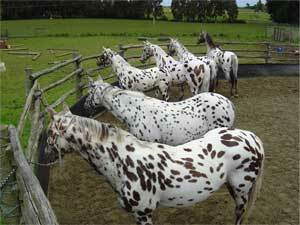 The pattern of spotting on any particular horse can vary over time, with spots appearing, disappearing and migrating.